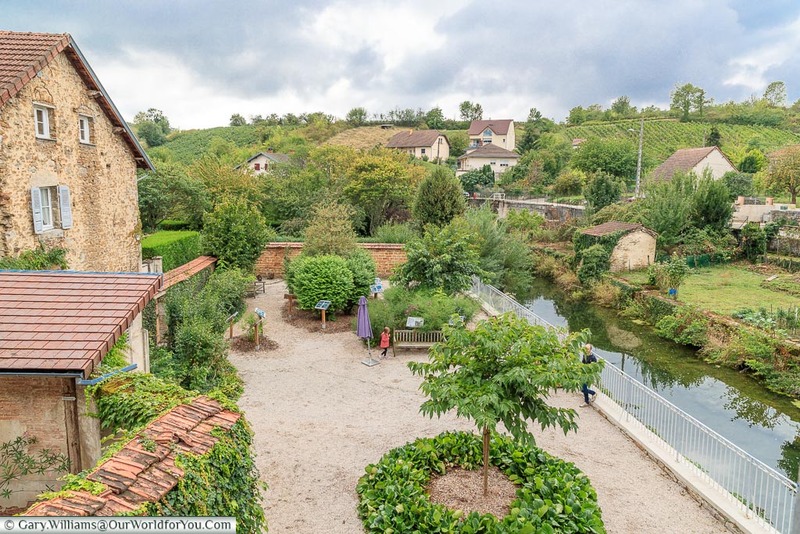 What a pleasant surprise it was to discover Arbois. 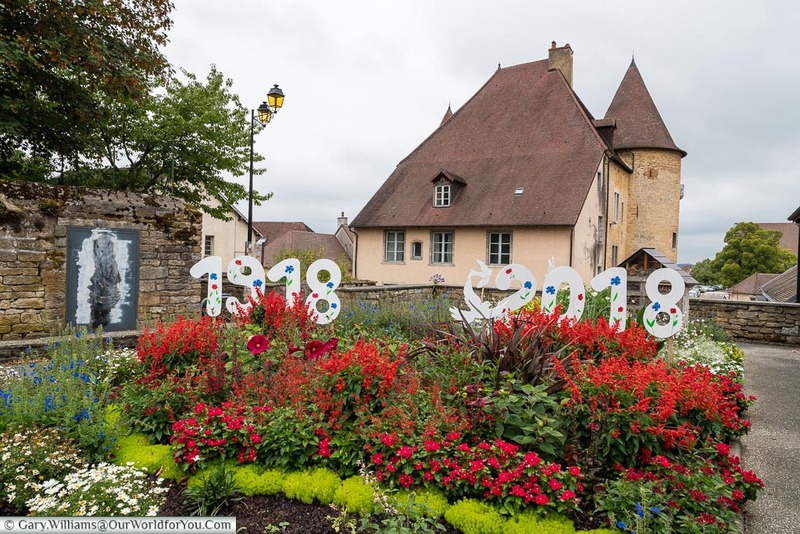 Gary and I had chosen Arbois as our first stop on our road trip south. 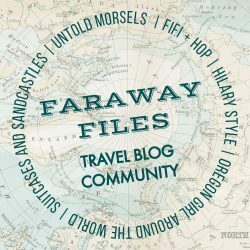 Rather than just hurtle through France, we enjoy breaking up the journey and visiting somewhere new on the way. We’d previously visited Dijon and Besançon, which are around an hour in either direction from Arbois. 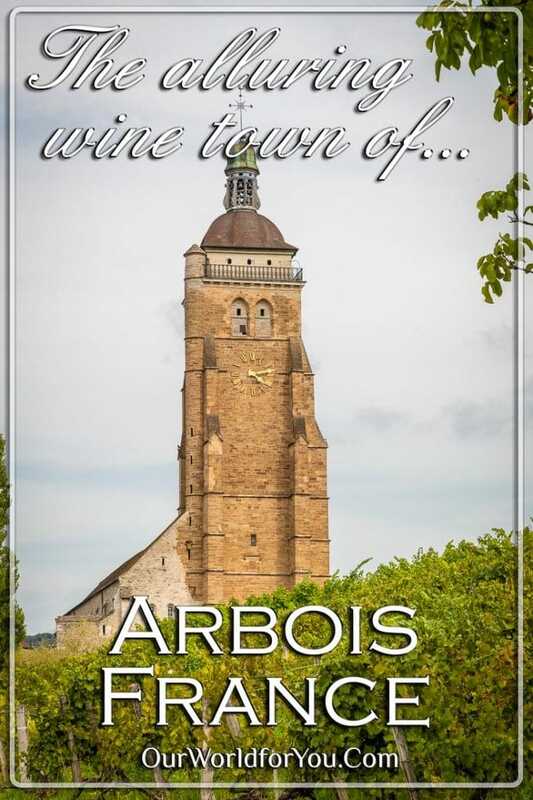 However, for some reason or another, Arbois had never popped up on our radar. That was all set to change. 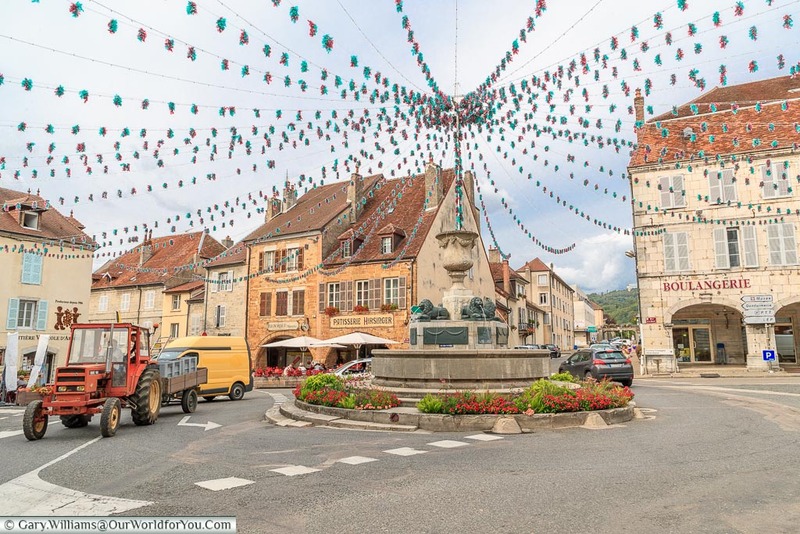 After a bit of research, we found out that this lush region of France was not only famed for its Comté cheese & its unique Vin Jaune and Vin de Paille (yellow wine & straw wine). 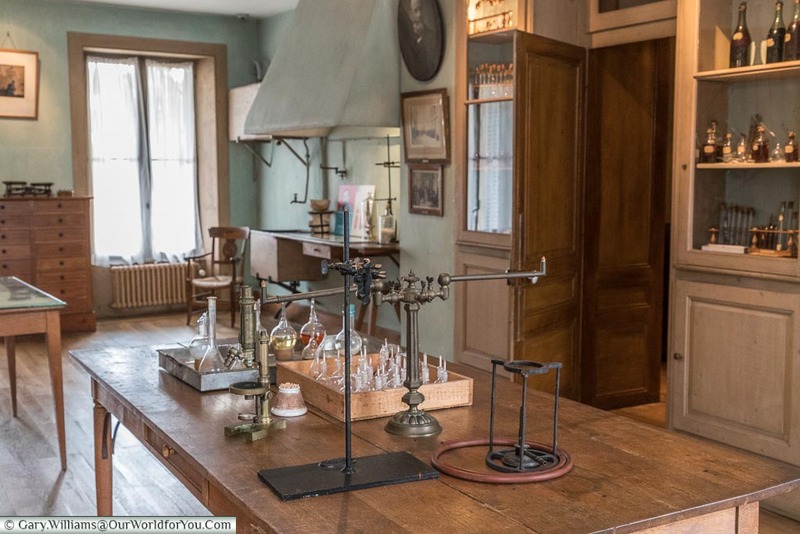 It was also the home of Louis Pasteur for several years. We’d appeared to have arrived during the grape harvesting season. So, one after the other, tractors were scurrying through the town laden down with their crop. It was great to see; however, you could tell that there were deadlines to be met. So, for our day around Arbois, what did we discover. 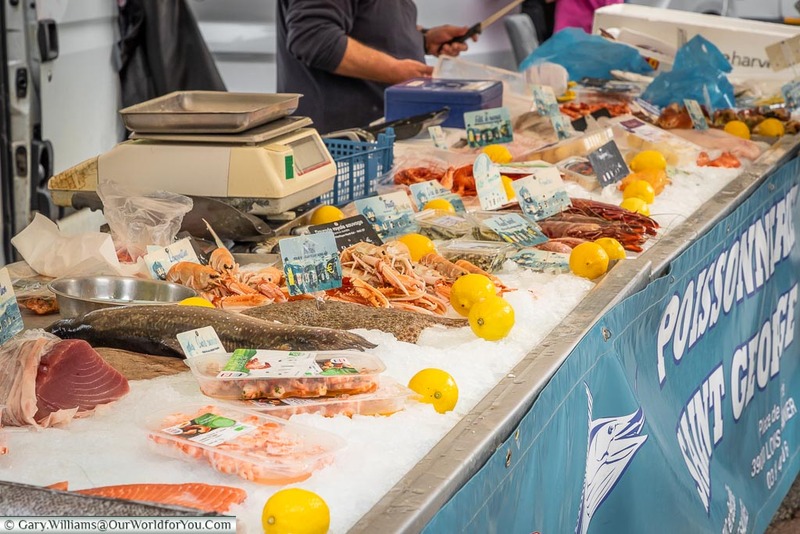 Well, firstly it was market day and regardless of how big or small a town or village is, the French certainly know how to hold a market. We can never resist taking a stroll through, feeling envious of the different local produce that we’d love to cook with. However, for this trip, we’ll just have to enjoy visiting the local restaurants (well, what a bind). 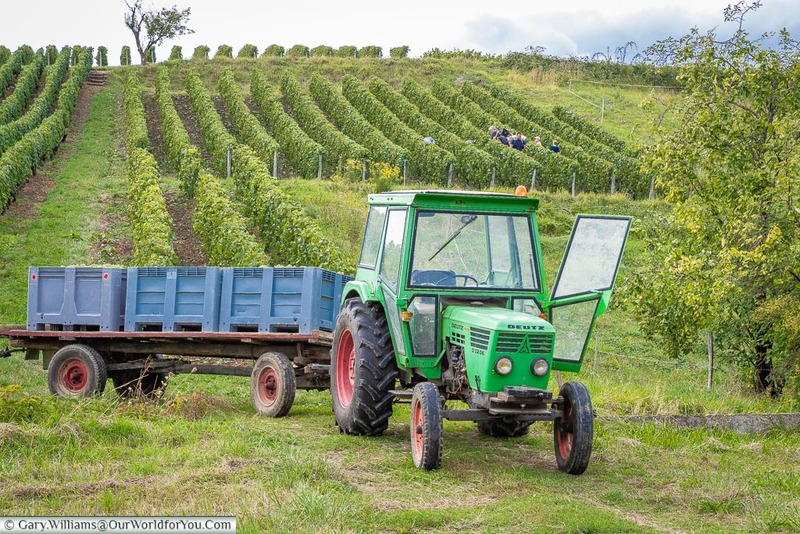 That Vin de Paille is a straw wine, the grapes are picked and left to dry for up to three months on straw mats & produces a very sweet wine. 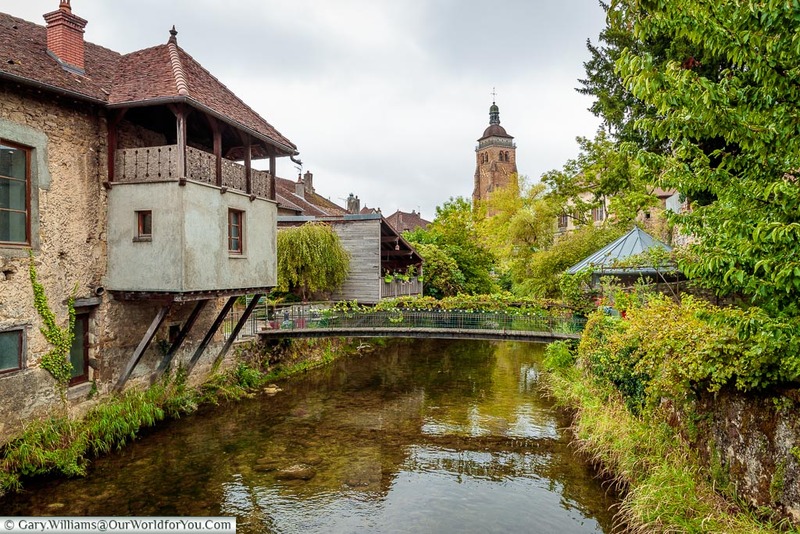 Arbois became a fortified town during the 13th-century, although most of the ramparts no longer exist. Three round towers and the square Gloriette tower still remain. 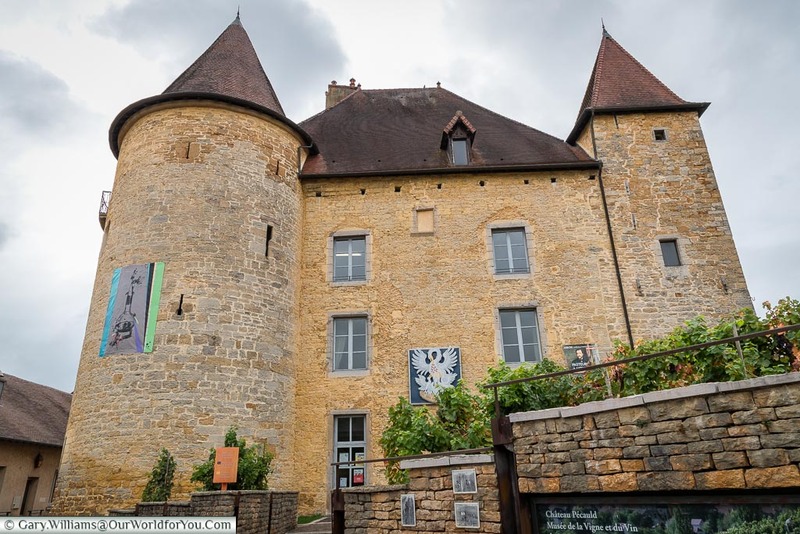 Along with what is now Château Pécauld, the Jura vine & wine museum. 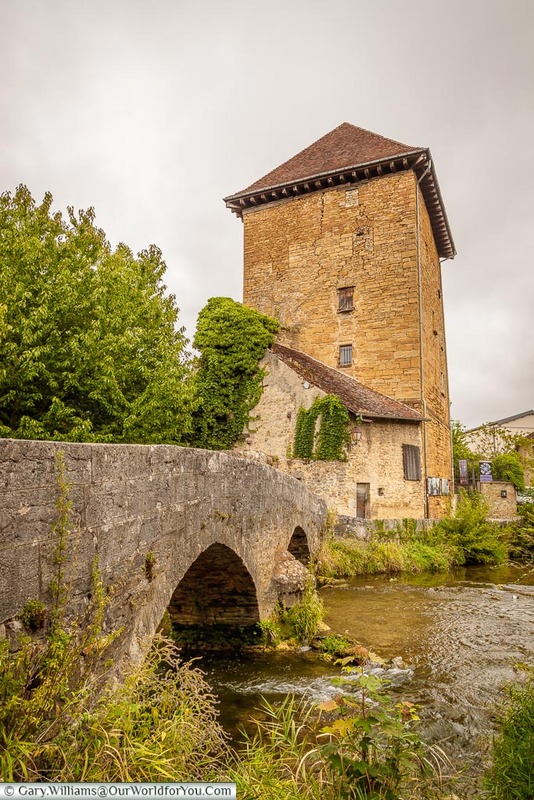 The square Gloriette Tower that stands along the River Cuisance was initially built during the 13th-century along with the Velfaux Tower, which is integrated into Château Pécauld. However, due to severe flooding, it had to be restored in the 16th-century. Straddling the River Cuisance, by the Gloriette is the very narrow stone bridge, Pont des Capucins. Which is quite cute and only just wide enough for two people to pass. 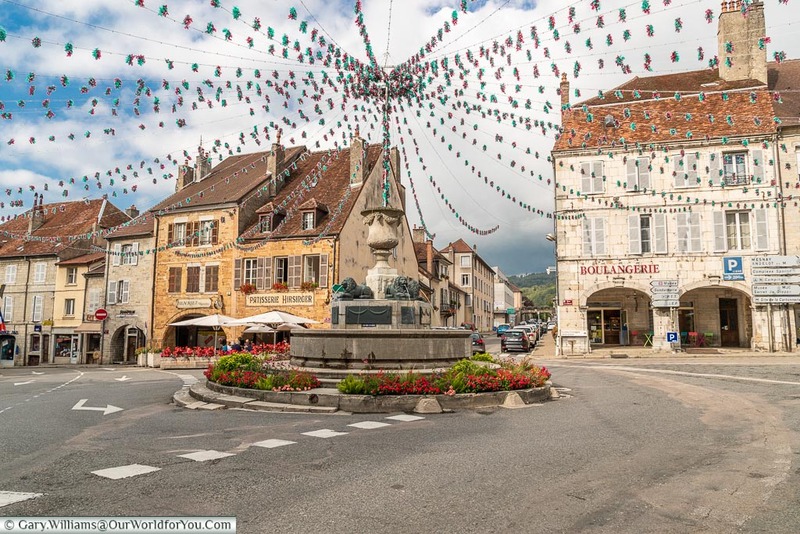 Visited the Jura region of France before, are there any other little towns I should add to my wishlist? 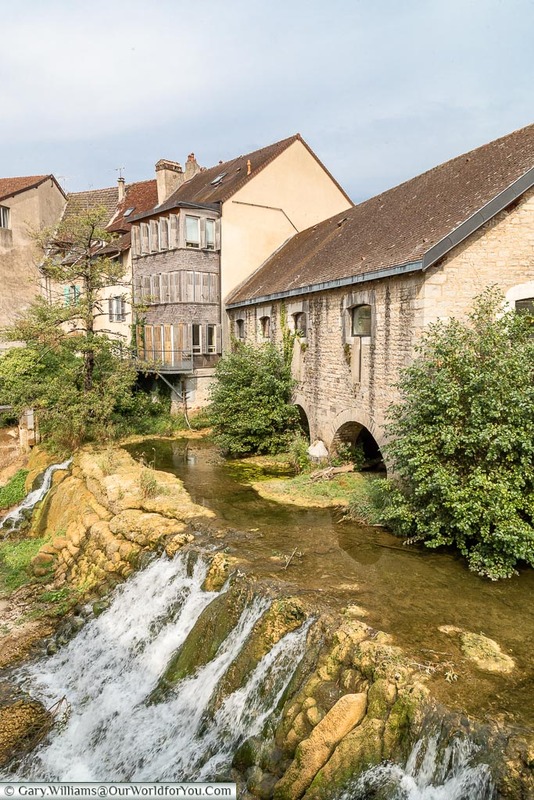 Just in this little area of Arbois, there are some charming spots to admire, bridges, weirs, waterfalls, decorated squares & a few steps away is Saint-Just Church. The tourist information is also located here. 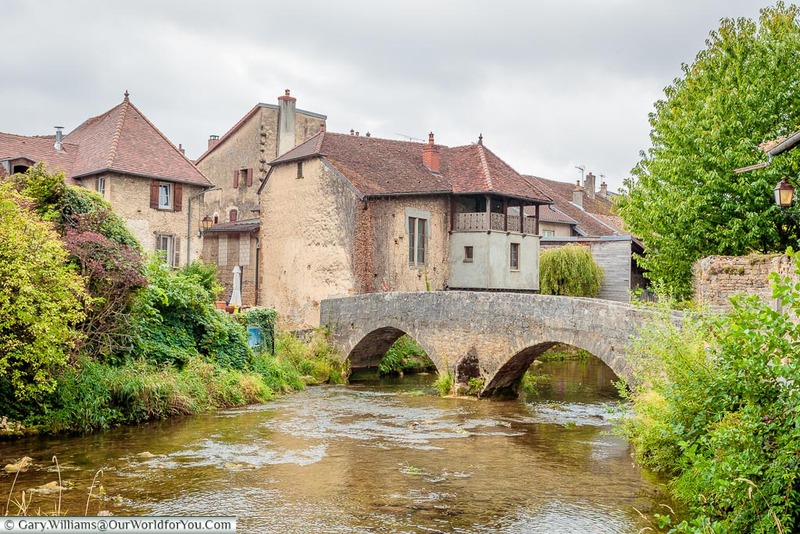 What I really enjoyed about Arbois was that not only was it a relatively small town & bustling with daily life, it was so easy to find quiet spots as well. 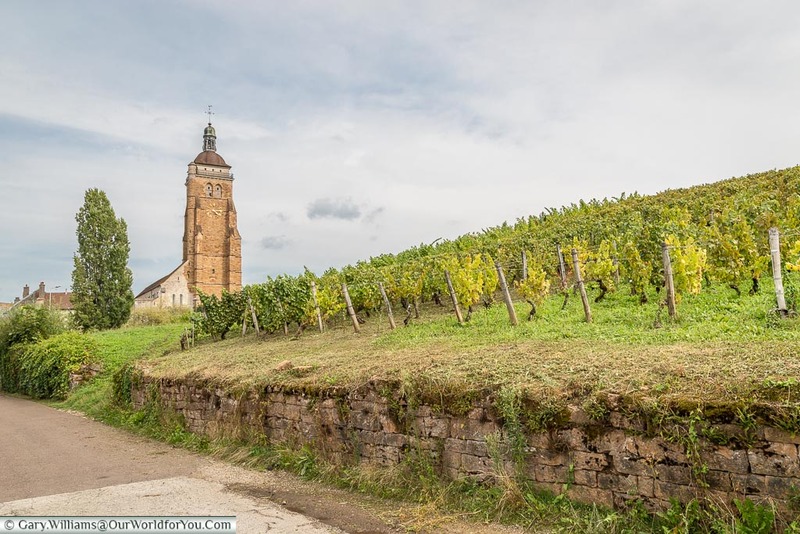 You felt like it was a place you could use as a base to discover the surrounding countryside & vineyards, then appreciate returning to of an evening. Although the spot I did just fall in love with was the Place de la Liberté. I could have sat there for hours watching the world go by. 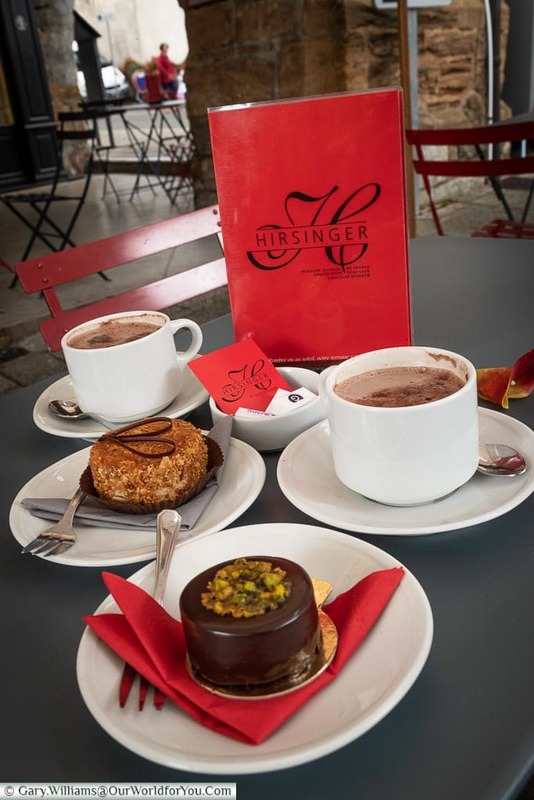 Surrounded by coloured shutters, tiled arcades, fluttering bunting and most of all the irresistible patisserie & chocolaterie mmmmm. 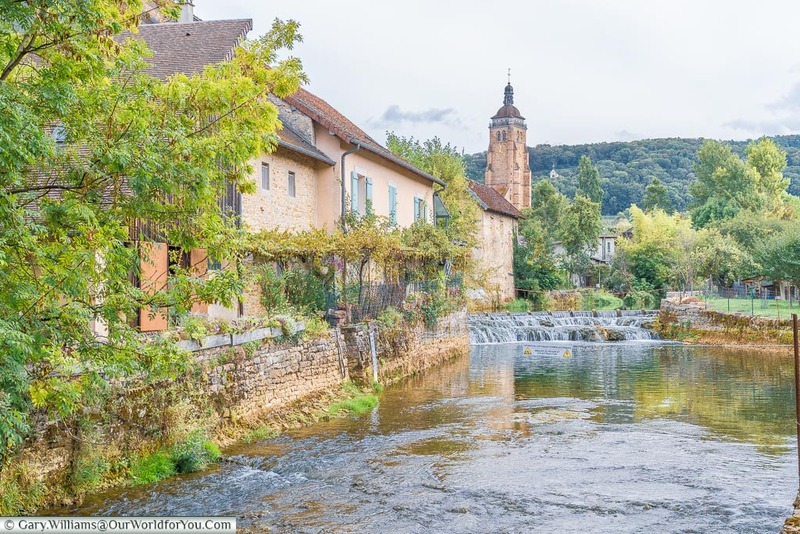 Discover more of France and create your own wine region tour. It’s so easy to do this on a road trip, SIXT car hire cover all budgets and allow you to pick up and drop off at different destinations. 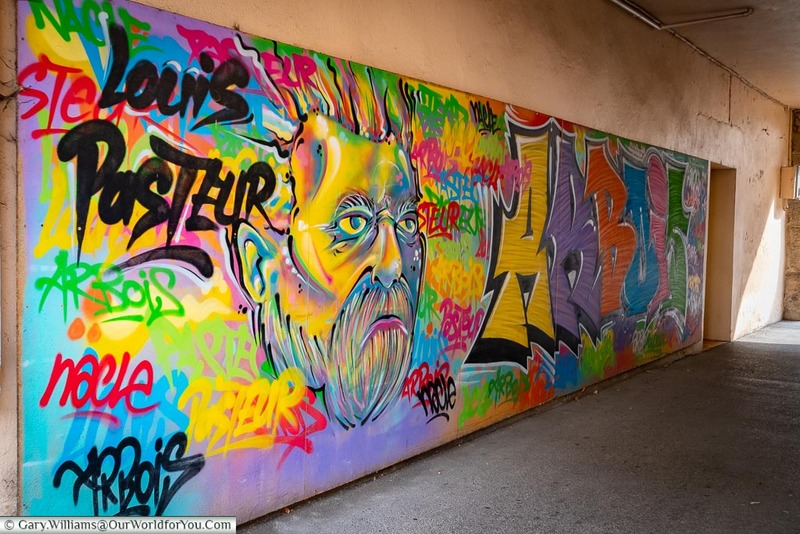 Louis Pasteur was born in Dole 22 miles away; however, his family moved to Arbois when he was young. He kept returning and owned a house here, where he lived with his wife and family. 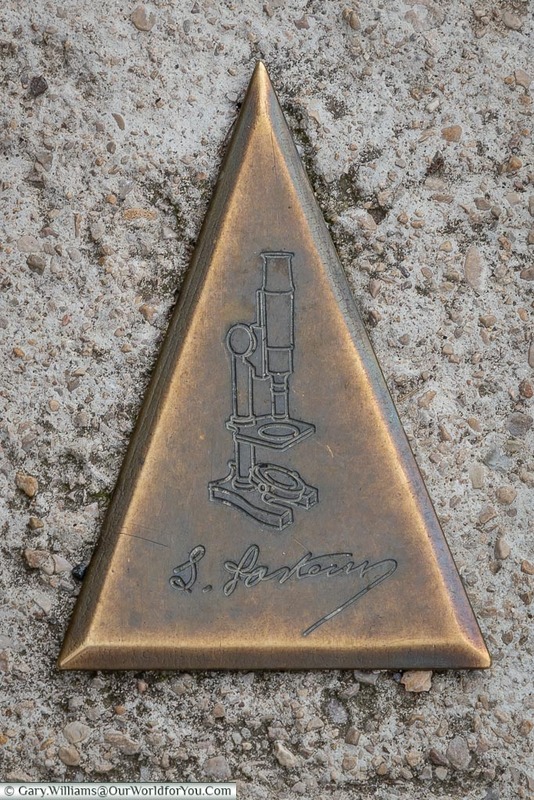 Just follow the little brass microscope plaques in the ground, and you’ll be taken on a short trail around the town. 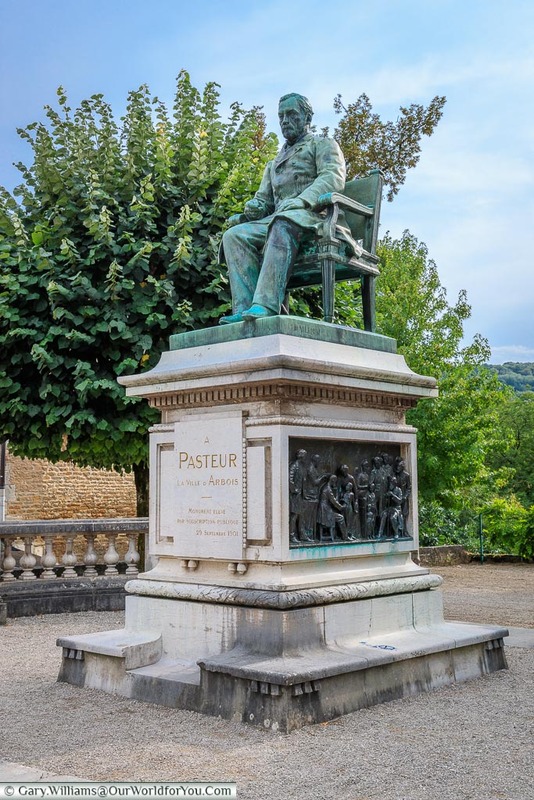 Passing by vineyards & streams, Louis Pasteur’s statue, the cemetery where three of his very young children are buried. Oh, and of course the obligatory street art. The route is really pleasant, we started at Louis Pasteur’s house. Here you’re given a self-guided audio tour in with your ticket price of €6.80 (2018). 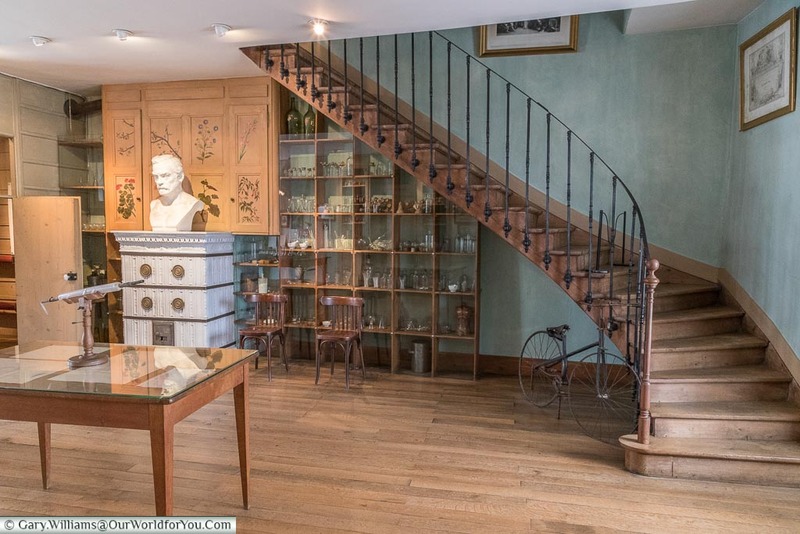 At your own pace, you’re able to discover all about Louis Pasteur’s family and the home they enjoyed together. You’re also able to see where Louis created his experiments in his own personal laboratory. 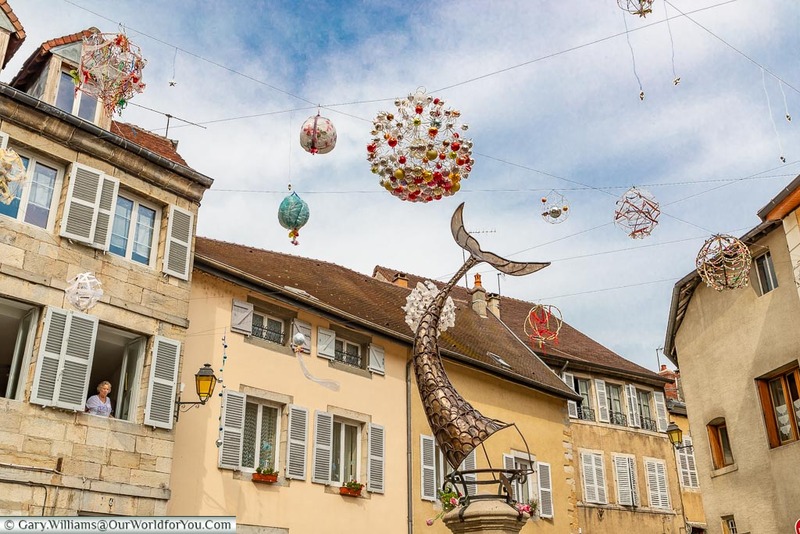 I fell in love with Arbois, and I can’t wait to discover more of the Jura region. I knew I would come up with another excuse to return to France. 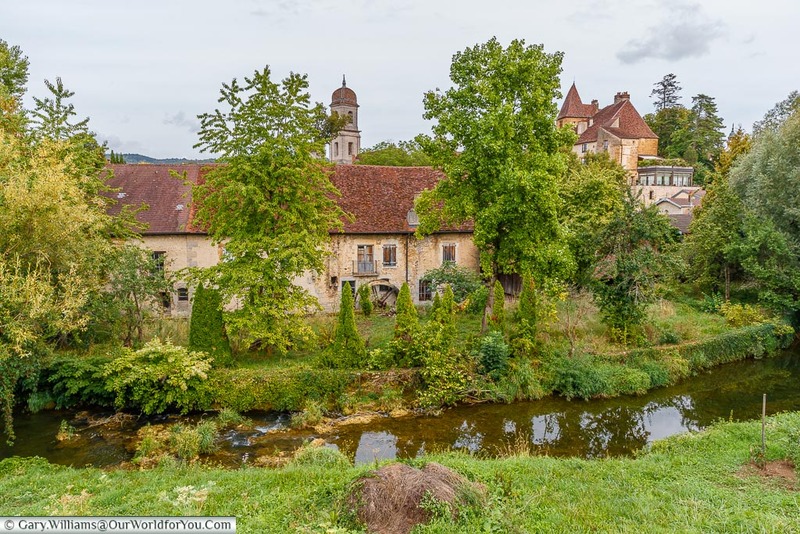 Our accommodation for the two nights we were in Arbois, was at Les Caudalies. It was a wonderful hotel, fantastic service and very friendly staff. It’s just a short stroll to the town & a great base to discover the region. 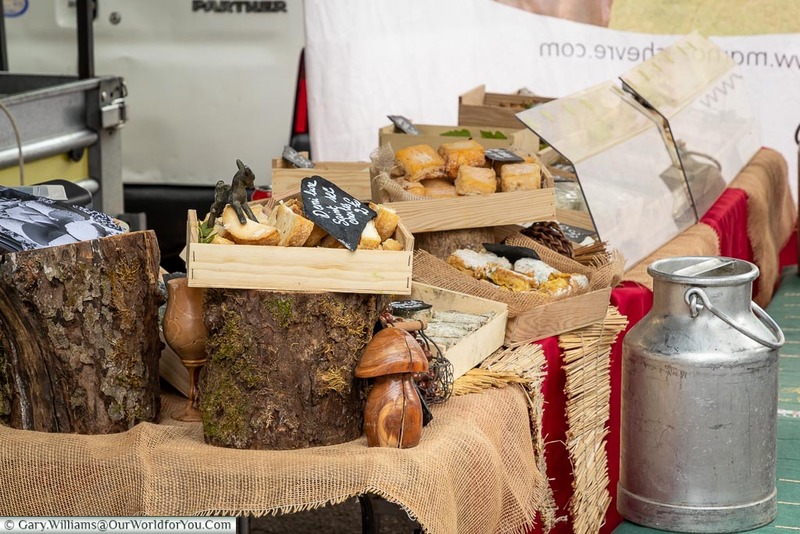 We highly recommend the taster menu that they offer in their restaurant, excellent quality food and a cheese board/trolley to die for. 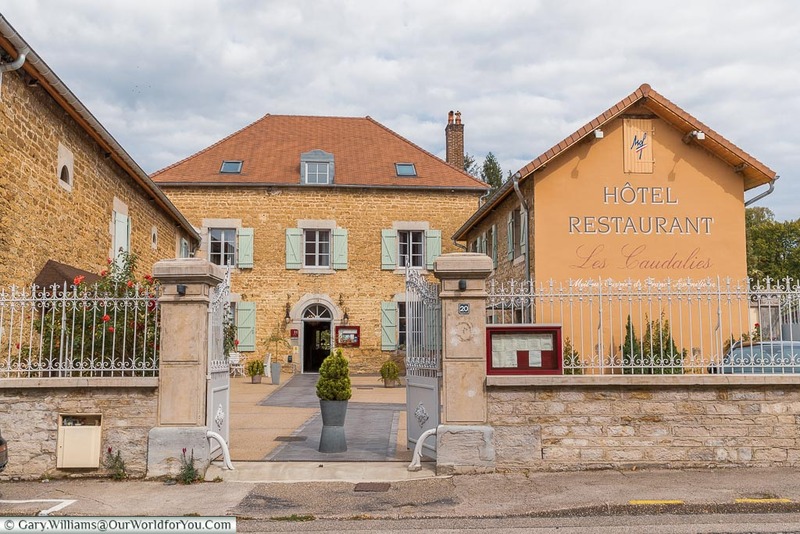 Our first night, we ate at La Finette Taverne, which specialises in regional cuisine. 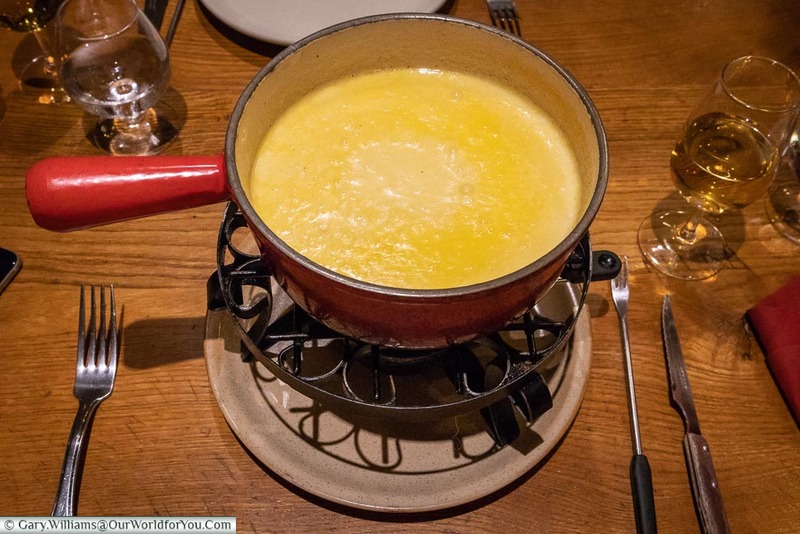 We had no other option here than to choose the Comte fondue, mainly because Gary absolutely loves fondue. I’m so pleased we did, it was delicious (and filling). We may have also had a sneaky bottle of Vin Jaune, for research purposes only, honestly. For our second night, as I mentioned above, we ate at our hotel to experience their taster menu. 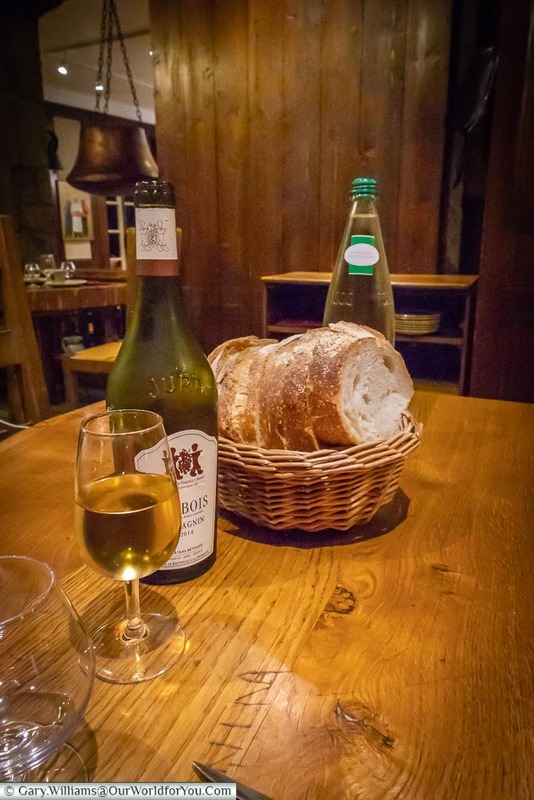 Good to know; If you’d like to eat at La Finette Taverne, I would highly recommend booking. 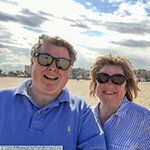 We were there on a reasonably quiet Thursday evening and couldn’t get a table until 9:30. 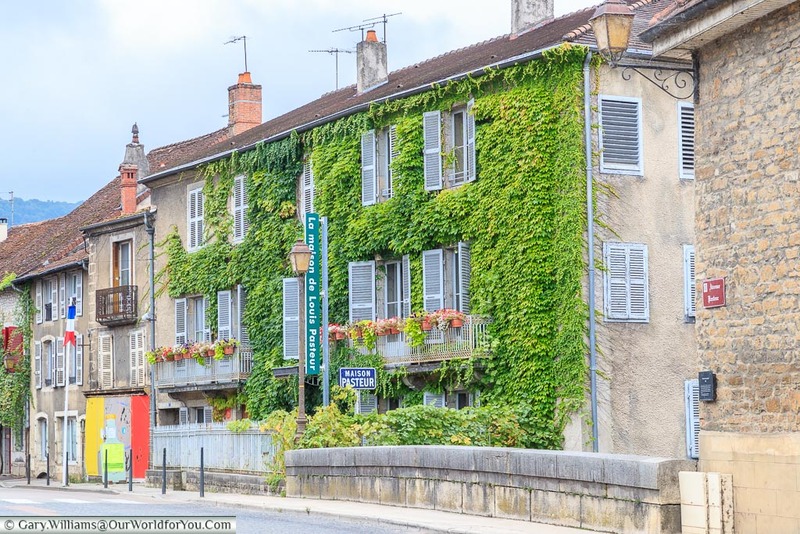 Stroll beside the vineyards and along the Cuisance river, or even take a peek in Louis Pasteur’s home. 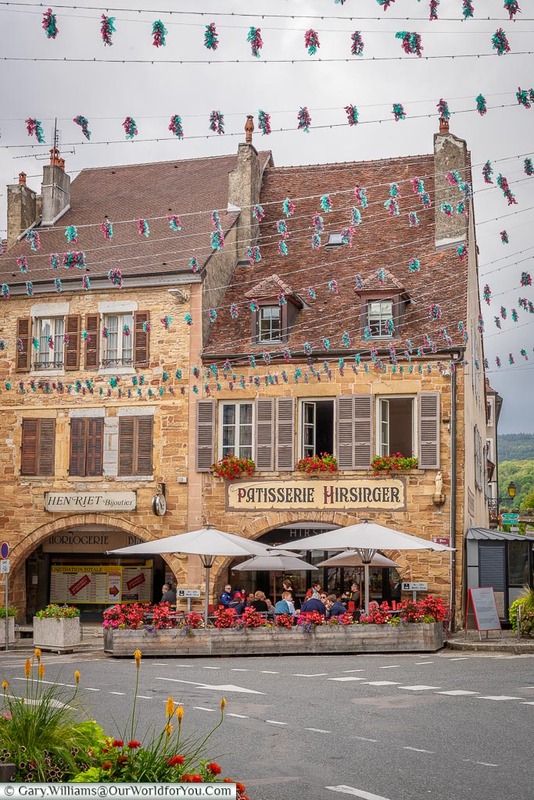 Why not stay at Les Caudalies and indulge in their taster menu?